Many people confuse being assertive with being aggressive. This is simply not the same. In order to understand the difference, here are the definitions as described in the dictionary. You will be learning how to assert yourself so that other people will not deny you of your rights. Assert: to state with assurance, confidence, or force; state strongly or positively; affirm. Insist on having one's opinions and rights recognized. Assert oneself: to insist on one's rights, declare one's views forcefully, etc. Aggressive: ready to attack or oppose; quarrelsome. As you can see there is a difference. By being assertive, you are only looking out for your own rights. You do not want to trample on other people's rights; you just want to make sure yours are not trampled on. So what exactly are the differences between assertiveness and aggressiveness? When you are assertive you ask people openly and directly for what you want. An assertive person shows confidence and reassurance when they make a request. Although you will be asking for your own wants and preferences, you always do it making sure that you respect other people’s rights. You do not expect anyone to be able to read your mind. You are direct and open in expressing yourself. Being aggressive means you will try to get what you want by whatever means it takes even if it causes bad feelings in others. An aggressive person may use manipulation, negative persuasion, threats and even resort to begging. An aggressive person does not think about the other person's feelings only what they want. An aggressive person does not want to look at both sides only their own and will use whatever means they can to get what they want. You may get what you want in the short term by being aggressive, but you will become known as a bad person or bully by using this behavior. When you become known as an aggressive person, people will want to avoid you or will immediately become defensive every time you ask them for anything. And assertive person is able to motivate and direct other people to respect their rights. By being assertive you are only clearly stating what you want in order to have your rights met. As an assertive person you are able to give direction to what you want in a positive, confident, but firm statement. In order to develop an assertive personality you will need to you learn how to make your requests known by using good eye contact, good body language and a firm confident voice. You should never try to belittle the other person or make them feel inferior or you will immediately turn them to the defensive side. Make sure to keep a good stance and keep your heads down to your side. Talk in a calm voice and make your feelings clear. If you use assertiveness correctly you will win friends and supporters as people will realize that you stand up for yourself and others. 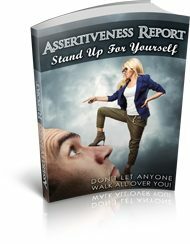 There are many courses, videos and audios available that can help you on your way to becoming more assertive. You can also learn how to be assertive in many situations by taking an Assertiveness Course. Build Your Confidence to Become More Assertive In order to be assertive you will need to develop confidence in yourself. It is easier if you try to take this one step at a time. Let's start off by just doing one small step and work from there. Here is an example of a simple starting point for standing up for your rights… Let's say that your spouse never picks up after themselves. You may say to them, honey, would you please pick up your socks off the floor? Now for some people this might work and they will pick up their socks. Unfortunately there are some people who will just blow you off when you ask them a simple request like this. If you live with one of those people, you will need to take another approach. One way to get them to pick up their socks is to make a confident statement, like; I am no longer going to pick up your socks off the floor everyday. If you do not pick up your socks and put them in the laundry they will sit there and every day more will pile up. You will have to live with the fact that your dirty socks are all in a pile and if you do not have clean socks to put on in the morning, you will need to either wash them or go without. You could also tell them if they will not pick up their socks and you have to pick them up they will go in the trash. If they run out of socks that will be their problem and not yours. We all have dreams. The problem is many of us have gotten into the habit of letting people squash our dreams. If you are serious about the things you want in life, then you need to go after them. You cannot allow other people to control you and keep you from reaching your dreams. When you are assertive you have control of situations instead of letting other people have control. Take a minute right now to look deep down inside and come up with a list of the things that you want for your life. Next, write a list of what you need to do in order to make these things happen for you. Tell yourself right now that you are not going to let other people hold you back anymore. Repeat to yourself out loud right now, I am strong and I can achieve my dreams. From now on if there is something that you want that will help you have the life you want, tell yourself I will speak up for myself, I will be assertive and I will show confidence. I will no longer let anyone put me down or be afraid to have my voice heard. I will no longer bow down to other people just because they're opinion is different than mine and accept it as my own opinion. I know that I am the only one that can make my goals and dreams come true. When you have confidence in yourself, than speaking to other people and letting them know your true feelings will come easier. As long as you believe in yourself and let that come out when you speak, people will respect your opinion and listen to you. You do not have any boundaries as to what you can achieve in life. Never let other people make you feel pressured into doing things that they want if you know that it is not something that you feel good about doing. When you speak to people with confidence and assertiveness you can persuade them to see your point of view. Once you get people to listen to your views and understand how you feel about certain things your confidence will grow. There is nothing wrong with giving yourself the chance to build your confidence and achieve all your lifetime goals. Once you develop the confidence to talk to others and let them know how you feel, you will start to feel great about yourself. Not only will you feel great about yourself but you will start to get along better with others as you gain their respect. Tell yourself right now, I am not afraid to go out and try new things. Spent some time today and go out and do something you've always wanted to do but were afraid of what other people would think of you if you did it. Now of course I'm not saying go out and do something that is illegal or immoral just something that takes a little more nerve than what you've ever had. When you learn how to stand up for your own rights, you will become more confident. Each day try to do one thing that you want instead of what somebody else wants you to do and you will be amazed at how much better you will start to feel. Once you start building your self-confidence and learn how to be more assertive you will find a new you that will have a much better positive attitude about life. Many people find listening to hypnosis audios on how to Boost Your Self Confidence helpful. Sometimes listening to hypnosis audios over and over again can be helpful by building your confidence in your subconscious mind. If things are repeated to your subconscious mind enough times it can become a habit to handle everyday situations better. There are many hypnosis audios that can help you in your everyday life situations. In order to be assertive, it is very important that you have a positive attitude. You must believe in yourself and your abilities to achieve whatever you want to do. Now I realize that sometimes it can be hard to believe in yourself, however, if you take small steps towards believing in yourself you will find it easier all the time. If you can just accomplish one act of assertiveness you will find it much easier to have a positive attitude. Take a minute right now to think of one thing that somebody does quite frequently that you allow to happen even though it stepping on your rights. Now put together a plan of action on how you will not allow this to happen anymore. Right down what you will say to this person the next time they try to do it. Now spend some time in front of the mirror and tell them exactly what you have written down. Look at your face when you are speaking and make sure you are looking yourself in the eye. This is how you want to handle it when you are talking to the other person. Make sure that you are using the proper body language, looking them in the eye and make your statement calmly but firmly. Once you have perfected what you will say to them the next time this situation arises then you are ready to handle it. Just think how great you will feel when you stand up for yourself. Each time you think of something that someone does to you that you allow, do this exercise again. The more you practice this the more you will begin to see things in a positive light. Each time the situation arises it will get much easier for you to show your assertiveness and be comfortable with any situation that you are in. By being positive and showing people that you will not allow them to walk all over you, you will become more comfortable each time with communicating your desires to other people. You will also become more self-confident and comfortable with yourself. Once you believe in yourself, it is much easier to get other people to believe in you and your ideas. When you show confidence and a positive attitude when letting people know what you want, they will have more respect for you. In order for you to be assertive you need to be driven, you need to know what it is that you really want out of your life. Take a few minutes right now and write down what you would like to see change in your life in the next 30 days. Take time every day to read this and do what it takes to make sure that these things will happen for you. In order for you to become more assertive and gain a positive attitude, you need to find the confidence to accept yourself and others for who you are and who they are. When you show confidence in yourself and other people see your confidence and assertiveness, you will build a new respect from others toward you. This little two letter word can be one of the hardest things for some people to say. If you are used to being a people pleaser and you will find it very difficult to learn to use it. You may want to take some time practicing saying it in front of the mirror. I'm sure that you have somebody in your life who is always asking you to do things for them. In fact if you do, they probably ask you to do the same thing quite frequently. So here's a little exercise to help you get through the next time they ask. Write down on a piece of paper what they will ask you to do. Next come up with a few good responses that will not come off as being rude, to let them know you will no longer be available to do this for them. Let's say you have a friend who constantly calls you and asks you to pick up their kids from school. They do not call you because they are stuck at work. They call you because they are shopping or out to lunch with friends. You being their friend, find yourself always saying okay, even if you had other plans. So let's write up a scenario for this. Your friend calls you and asks you to please pick her kids because she is stuck at the mall? You could say, you know I will not be able to do that, as I have plans for this afternoon. You could say, you will need to start picking up your own children as I have things that I need to do myself and do not feel it is fair for you to call me every time you want to go run around and do not take care of your own responsibilities. Whatever you come up with, practice saying in the mirror until you feel you can say it calmly and confidently to get your point across. The only thing that comes from always saying yes is people expect you to take care of their problems for them. They do not respect you and most the time did not even appreciate you. Oh, they may always say thank you and you are so wonderful, what would I do without you. But don't let them fool you these are just words to keep you on the string.